If you’re looking for paper crafting inspiration Paper Pumpkin is here to inspire you and bring creativity to your door each and every month. 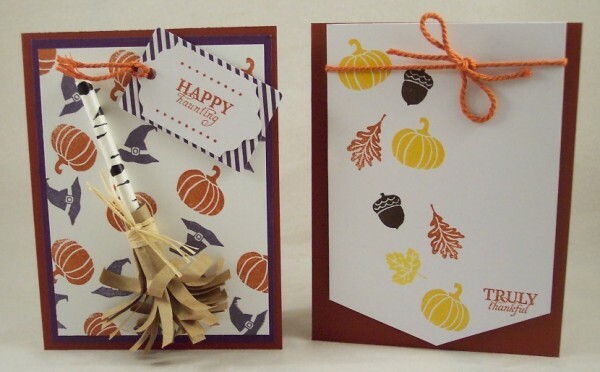 Paper Pumpkin is a subscription kit brought to you by the folks at Stampin’ Up. When you sign up you’ll get a box full of just about everything you need to complete multiples of that months project along with an instruction sheet and a link to an on-line video tutorial. Kits might include things like a clear stamp set, blank cards and envelopes, ink pads, stickers, embellishments, washi tape, twine and more. In most cases scissors, adhesive are all you might need to complete the projects, a clear stamping block will be included in your very first kit. This months kit includes everything you need to make 8 fun witches broom/haystack treat bags. Including fringed paper sacks, pre-cut, adhesive wrap around fringe, patterned straws, colored twine, raffia, 2 different shaped die cut tags, a mini ink pad and fun clear stamp set. For my project shown above I followed the directions in the kit but I also wanted to make some alternative projects so I made 2 cards with some of the supplies. One has a background stamped with the stamp set and a smaller version of broom along with the tags. The other card is perfect for Thanksgiving with falling leaves , pumpkins and acorns, the top is tied with the twine from the kit. If you’d like to be inspired and get crafty every month with a Paper Pumpkin kit you can sign up here or talk to your Stampin’ Up consultant. The cost is $19.95 a month and even if you aren’t a subscriber you can still purchase any available past Paper Pumpkin kits. 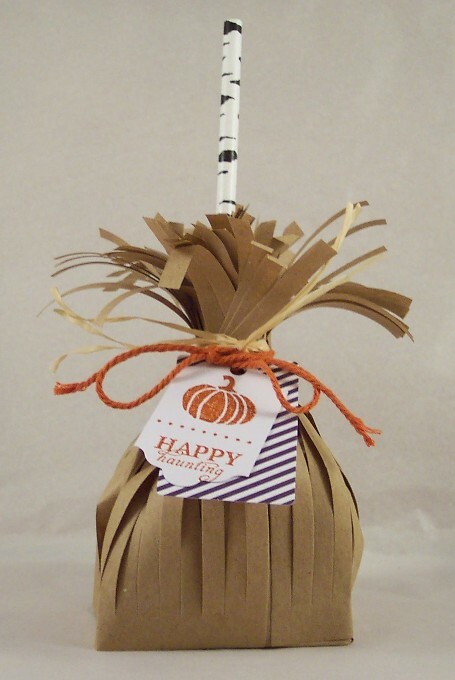 Or you have a chance to win this months Paper Pumpkin kit! The generous folks over at Stampin’ Up are offering to giveaway a kit to one lucky Craft Gossip reader, simply leave a comment below to be entered, one comment will be randomly chosen. One comment per person, open to US residents only. Giveaway runs from today through 9/27/15. But if you don’t win this month check back next month because each month we will be giving away one Paper Pumpkin kit, how amazing is that?! Great way to get my granddaughter started in crafting. Thanks. This kit is very cute! Love the fall theme! I would love the chance to win this great fall themed kit! I love the pumpkin and leaf stamps! Actually all of them look so cute! Halloween is my favorite holiday!! Gosh, I love all those fall stamps and materials! Thanks for this wonderful giveaway!! Love it! I may have to try out that broom! This looks such a generous and fun kit. I’ve been out of the country for three years. This looks like some great crafting to do with my grandkids. I just can’t believe it is fall already!!! Love the broom card. I love, love, love fall!!! And I would really love to win this fall kit!! This looks fabulous! thank you! I love everything about pumpkins! This kit would be so much fun to work and play with and make something cute to decorate my mantle with. Happy fall! I love the leaves and acorn stamps! This looks like a fantastic set! Thank you so much for the chance to win. So cute! Would be neat for adorable for grandkids!! So cute And what a great card. These craft kits sound like so much fun! Love to try this kit and make some special memories with my granddaughter. Fall is my favorite time of the year. I love the colors and the falling leaves. This kit looks to be perfect for the season! Looks like a fabulous kit, love the cards! Great gift to decorate with…. Adorable! I would love to win this kit! I would love to win this! What a great idea! Love this idea! Love Stampin Up products! Thanks for the chance to win.